In our golden years, some of us may no longer be able to drive, which is why one of the biggest beneficiaries of driverless car technology could very well be older people. A new self-driving car startup, Voyage, wants to see how the elderly interact with the new technology. This is actually a clever idea. This week, the company deployed a pair of autonomous to a retirement community in California, aiming to test out the tech in an ideal proving grounds and gather feedback from the 4,000 residents whose average age, according to the New York Times, is 76. 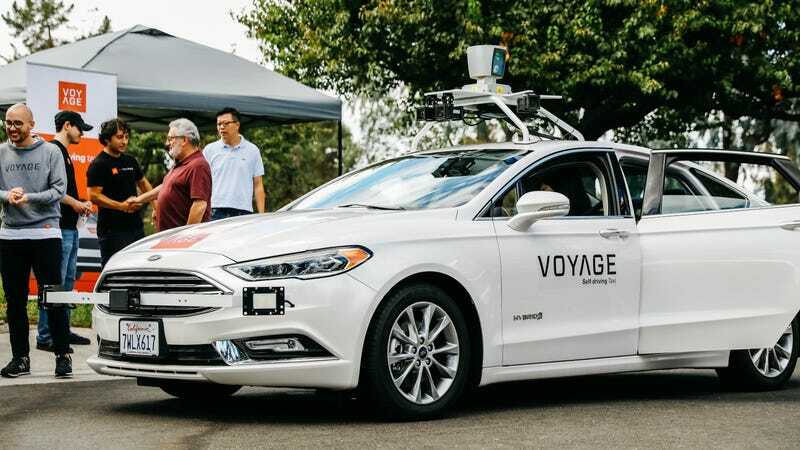 Using two Ford Fusions refitted with a suite of autonomous technology, Voyage’s pilot program will allow residents of the Villages Golf and Country Club in San Jose to hail a taxi and ride anywhere—for now—along a two-mile loop, the Times reports. Eventually, the goal is to allow residents to summon a Voyage car for free door-to-door service. It wasn’t the easiest time to get the pilot program off the ground, reports the Times. The agreement to offer self-driving car rides in the retirement community almost fell apart when negotiations hit an impasse over insurance. California requires autonomous vehicles to have $5 million of coverage, but the Villages insisted on 50 percent more coverage because it is a private community with more liability risk. Voyage found an insurer, the Times reports, but the startup only received coverage after it agreed to share non-identifiable sensor data. Beyond providing a service for the residents, Voyage says the Villages has superb terrain for testing and improving autonomous tech, with 15 miles of winding roads and a speed limit that maxes out at 25 mph. It seems like an ideal situation—a complex environment to work out and improve upon the technology. It’ll be worth keeping tabs on, too, to see how the residents respond to it.